Gastro Race is a natural feed supplement, comprising of Ascophyllum nodosum and Lithothamnium, which is specifically formulated for racehorses. It provides a balance of vitamins and minerals and uses a natural approach to support efficient digestion, providing gastric and hindgut comfort. It also supports immune health, bone density and joint mobility and may reduce stress reactions and improve recovery times. 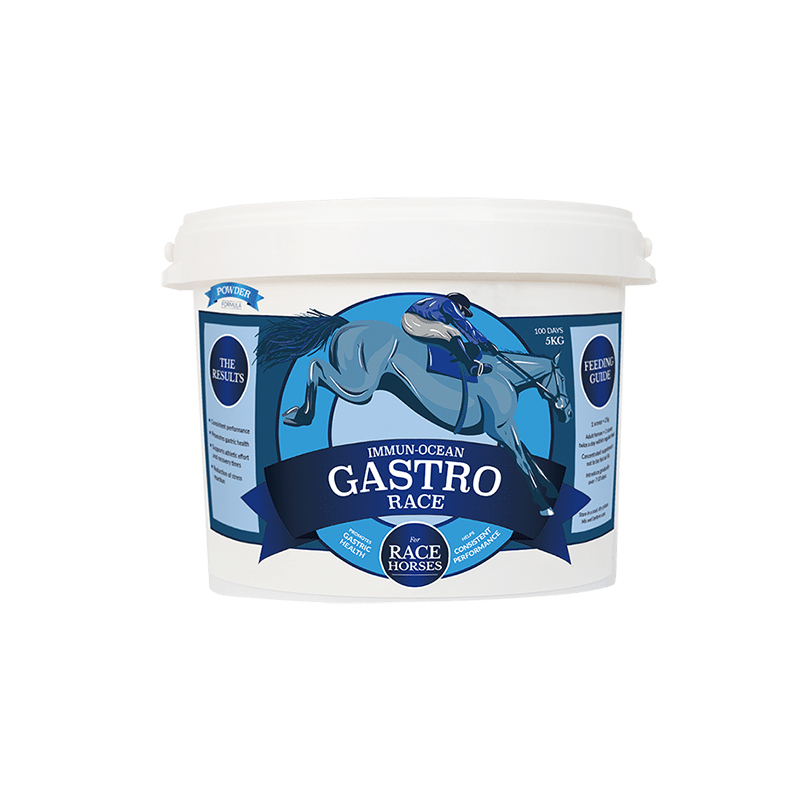 It is suitable for horses racing under all jurisdictions, as it contains no listed banned substances and the inclusion of MSM and magnesium makes Gastro Race the perfect choice for any racehorse. Gastro Race contains soothing properties to help ease irritation and promote intestinal health, as well as a healthy balanced digestive system. It encourages the growth of friendly bacteria for regular gut function and enables the horse to utilise all of the nutrients in their feed. MSM, an organic sulphur, found naturally in abundance in Ascophyllum, helps to maintain healthy and flexible joints, offering your horse both short and long term joint support, whilst the optimum levels of magnesium help with nerve and muscle function. Ascophyllum nodosum seaweed from the cold North Atlantic has been used for centuries as a natural feed supplement, low in iodine and rich in vitamins, minerals and amino acids. It is composed of 48 elements, 16 amino acids and 11 vitamins. The macro algae are hand harvested in accordance with sustainable and traditional methods, which have been used for centuries along the Atlantic coastline of Ireland. Lithothamnium calcareum is a red algae belonging to the Corallinaceae family. It grows extremely slowly, giving it time to filter and absorb large quantities of sea nutrients. Lithothamnium provides a rich supply of minerals including 32 trace elements. This supplement is 100% natural and contains a balanced mix of minerals, vitamins, amino acids and antioxidants that help to promote a healthy immune system and aid the overall wellbeing of racehorses. Available in 5kg tubs, in powder form. Contains garlic for palatability. Feeding Instructions: Feed 25g twice a day and introduce it gradually. Calcareous Marine Seaweed (Lithothamnium) spp, powder, Ascophyllum nodosum low temperature dried granules, yeast, live yeast (Sacchromyces cerevisau), flax oil, magnesium oxide and other minerals. Cadmium 0.37 mg/kg, Copper 170 mg/kg, Fluoride 370 mg/kg, Iodine 96 mg/kg, Lead 0.44 mg/kg, Mercury 0.1 mg/kg, Magnesium 52000 mg/kg, Molybdenum <3 mg/kg, Nitrogen 0.58 %, Phosphorous 680 mg/kg, Potassium 5300 mg/kg, Selenium <3 mg/kg, Zinc 390 mg/kg. Also contains cereals and flavours to enhance palatability. Immun-Ocean Gastro does not contain any ingredient known to contravene the Jockey Club, FEI or BSJA rules. Immun-Ocean Gastro is free of contaminants such as caffeine, theobromine, hyoscine, hordenine, morphine and atropine. Note: the values listed above are typical. Components of Immun-Ocean Gastro are natural products of marine origin and as such, are subject to seasonal variation.